Abstract : Preserving the cultural heritage of the performing arts raises difficult and sensitive issues, as each performance is unique by nature and the juxtaposition between the performers and the audience cannot be easily recorded. In this paper, we report on an experimental research project to preserve another aspect of the performing arts—the history of their rehearsals. We have specifically designed non-intrusive video recording and on-site documentation techniques to make this process transparent to the creative crew, and have developed a complete workflow to publish the recorded video data and their corresponding meta-data online as Open Data using state-of-the-art audio and video processing to maximize non-linear navigation and hypervideo linking. 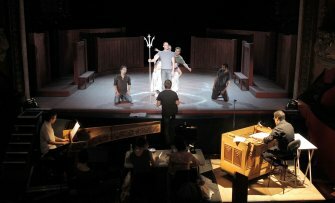 The resulting open archive is made publicly available to researchers and amateurs alike and offers a unique account of the inner workings of the worlds of theater and opera.